Frustrated by endless searches for features on the ribbon? Download and install this software to bring back the familiar menus and toolbars to Microsoft® Office 2010, 2013, 2016, 2019 and 365 (includes Office 365). The classic view allows you to work with Office 2010, 2013, 2016, 2019 and 365 as if it were Office 2003. New Features. All new features and commands for Office 2010, 2013, 2016, 2019 and 365 have been added to the menus and toolbars. More Applications. The suite not only includes Classic Menu for Microsoft Word, Excel and PowerPoint, but also includes Classic Menu for Microsoft OneNote, Outlook, Publisher, Access and InfoPath 2010, 2013, 2016, 2019 and 365. Save Cost on Training and Tutorials. Give your users a smooth learning curve. They will not require any training and tutorials when upgrading to Office 2010, 2013, 2016, 2019 or 365 (includes Office 365). All new features and commands for Office 2010, 2013, 2016, 2019 and 365 (includes Office 365) have been added into the classic style interface. The Office 2010/2013/2016/2019 ribbon tabs are kept fully intact so that you can truly get the best of both worlds. With the Office 2010/2013/2016/2019 classic view and old look, you can still enjoy many features of Office 2003, Office XP and Office 2000 that have been removed from the ribbon in Office 2010, 2013, 2016, 2019 and 365. The Classic Menu for Office not only supports 32-bit Office, but also supports the 64-bit version. It doesn't require the .NET Framework. The file size is small, and it runs faster! We provide a common installation package and the Microsoft Installer Package (MSI) for users from enterprises and organizations. Administrator can change the default setting and enter license info into the package and then deploy the software to all client computers in their enterprise or organization. There is no need to install the software on the computers one by one. The administrator can also change the common setting and apply it for all users on Terminal Server. The software supports all languages that are supported by Office 2010/2013/2016/2019 including: English, French, German, Italian, Spanish, Portuguese, Japanese, Dutch, Chinese, and more. If you change the language of Office, the language of the classic menu will automatically be changed. There is no need to change any settings. All languages are included in a single installation package. This is a free download with full features, free support and updates (service packs, patches and higher versions of the Classic Menu for Office)! We offer a 60-day money-back guarantee. Just send an email mail to sales@addintools.com and tell us your order info, and you will receive the refund. Users can browse the entire menu with keyboard shortcuts. Simply insert Q into the original shortcuts of Office 2003/XP(2002)/2000. For example, since you press Alt + T to open the "Tools" menu in Office 2003, you just need to press Alt, Q, T to open the "Tools" menu in Office 2010, 2013, 2016, 2019 and 365). The suite includes the Classic Menu for Word, Excel, PowerPoint, Outlook, Access, OneNote, Publisher and InfoPath 2010, 2013, 2016, 2019 and 365. It brings back the old interface to 2010/2013/2016/2019, and makes Office 2010, 2013, 2016, 2019 and 365 look like 2003, XP and 2000. If you also use Project and Visio 2010, 2013, 2016, 2019 and 365, the Classic Menu for Office Enterprise is the better choice. Help your employees to use Office 2010/2013/2016/2019 without having to learn specialized skills. Your members won't need training or tutorials after upgrading to Office 2010, 2013, 2016, 2019 or 365 programs. Get the software to equip your enterprise or midsize business for success, help increase productivity and reduce training costs. Have you never used Office 2003 (or XP, 2000 or 2007) before? The software will help you learn to use the Office 2010/2013/2016/2019 in another way - Classic User Interface. You can easily browse all features of the menus in text mode, and you won't need to remember the position and style of every icon. Did you use Office 2003 (or XP, 2000 or 2007) before? To those who are not so familiar with the new user interface of Office 2010, 2013, 2016, 2019 or 365, the menus will be great help and provide a smooth learning curve. It will also help improve productivity. Installing the software is much easier than installing other add-ins for Office. The installation is just like that of other common software. You can select any classic menu components when you install. You do not need any special skills or technology to use it. It is easy to show or hide the tabs of the ribbon. 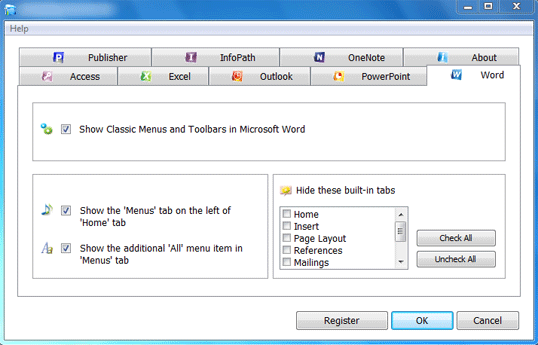 It is easy to enable or disable the classic menus and toolbars. You can change the position of the classic menus tab. The software is fully compatible with Microsoft® Windows® 10/8/7/Vista (32/64), XP, Windows Server 2003/2008/2012/2016 (32/64), Windows Terminal (Remote Desktop) Server and Citrix System. How to hide classic menus temporarily? Is there a way I can use the keyboard shortcuts to access the classic menus? Administrator Can Change the Default Setting for All Users on Terminal Server or Computer. *Microsoft and the Office logo are trademarks or registered trademarks of Microsoft Corporation in the United States and/or other countries.